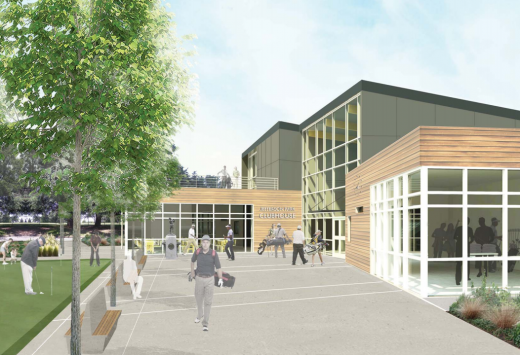 The Jefferson Park Golf Clubhouse and the new development planned for the southeast corner of the Beacon Hill Station block — both topics of a fair amount of neighborhood interest — are on the agenda for the next North Beacon Hill Council meeting Tuesday, April 3 at 7 p.m. at the Beacon Hill Library community room. questions and voice your opinions. The Beacon Hill Library is located at 2821 Beacon Avenue South. All are welcome to observe or participate in the neighborhood council; you are part of the council when you attend your first meeting, and you have voting privileges when you attend your second. Previous PostApplications filed to subdivide on Sturgus, expand at El CentroNext PostIs this dog yours? And have you seen a missing golden retriever? I just adore the clubhouse building. I would be very sad to see it go. It’s one of Beacon Hill’s remaining gems. -Designed in 1936 by Archibald Torbitt, a renowned Pacific Northwest architect with six buildings in Washington on national or state historic registers. -Built with WPA labor, while the Parks Department provided materials. -Boyhood hangout of famous golfers Fred Couples and Bill Wright Jr. Their photos are displayed inside the clubhouse. -Home course of the Fir State and Cascade golf clubs. -75 years of history and service to multiple generations of South Seattle golfers. -Best cheeseburger and fries on Beacon Hill, and a pretty good selection of bottled beer. I just saw your comment, Mark, thanks for sharing!